Manchester United midfielder Paul Pogba will miss Sunday's Premier League match at Middlesbrough with a hamstring injury. 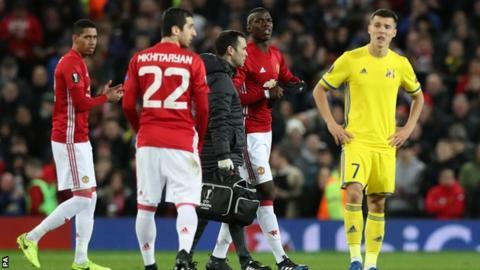 The France international pulled up in the second half of United's Europa League win over FC Rostov and had to be replaced by Marouane Fellaini. The 24-year-old is also expected to miss France's matches against Luxembourg and Spain later this month. United boss Jose Mourinho could not say how much longer Pogba would be out. Asked whether he would be out for around three weeks, Mourinho replied: "Yeah. I don't know for sure, but for sure, no Middlesbrough and no national team." Pogba, the world's most expensive player, has provided seven goals and five assists in 41 matches for United this season, but has been criticised for his recent performances. Before the match, Mourinho defended his player by saying: "I feel that the world is losing values and I am scared about the level of envy coming in. It is not Paul's fault that he gets 10 times the money some players did in the past." Dutchman Daley Blind also went off in the match with what looked like concussion, but no news was given on the extent of his problem.